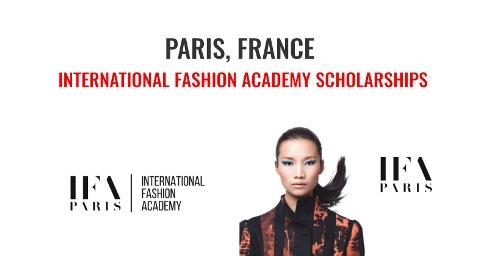 International Fashion Academy is inviting applications for Fully-funded Scholarships. Scholarships are available for pursuing undergraduate and postgraduate programme. IFA Paris is registered at the Academie de Paris under the Ministry of Youth, Education and Research as a private higher education institution and is also listed on Campus France, the French national agency for the promotion of higher education. International Fashion Academy main objective is to not only train its students, but to also make them better professionals to join the competitive environment of the fashion and luxury industry, in France, in China, in Turkey and anywhere in the world. When applying to IFA school in Paris. Non-native English speaking students are required to provide an IELTS score. An overall score of 5.5 is preferred for undergraduate courses and 6.5 is preferred for postgraduate courses. In Shanghai, students whose English proficiency is below par are required to attend additional language classes. Course Level: Scholarships are available for pursuing undergraduate and postgraduate programme. Study Subject: For undergraduate, scholarships are awarded in the field of Fashion Design & Technology and for masters in the field of Contemporary Fashion Design. Number of Scholarships: Numbers are not given. All applicants at the Undergraduate Bachelor level need to be high school graduates or equivalent. Non-native English speakers need to provide an IELTS score of 5.5 or above, or a TOEFL score of 65 or above. Alternatively, provide an English training certificate or proof of previous education in English. Strong motivation in fashion design or fashion business area. Fill in the online application form and upload: latest high school transcript, copy of high school diploma or equivalence, Motivation letter, Resume/CV, passport photo and copy of passport. All documents should be in English or translated to English by a professional translator. If you are applying for the Bachelor in Fashion Design & Technology, you are required to attach your portfolio. Interview (on campus or Skype). All applicants at the Postgraduate Master/MBA level need to be Bachelor graduates. Ideally have a Bachelor degree in Business Administration, Marketing, Media & Communication and Fashion Design related fields. Non-native English speakers need to provide an IELTS score of 6.5 or above, or a TOEFL score of 79 or above. Alternatively, provide an English training certificate or proof of previous education in English. Significant professional experience in related fields preferred, but not required (internships are taken into account). Fill in the online application form and upload: latest transcript, copy of Bachelor diploma or equivalence, Motivation letter, Resume/CV, passport photo and copy of passport. All documents should be in English or translated to English by a professional translator. If you are applying for the Master of Arts in Contemporary Fashion Design, we require your portfolio. English Language Requirements: When applying to IFA school in Paris. Non-native English speaking students are required to provide an IELTS score. An overall score of 5.5 is preferred for undergraduate courses and 6.5 is preferred for postgraduate courses. In Shanghai, students whose English proficiency is below par are required to attend additional language classes. The application process is the first important step into your future at IFA Paris. We value each individual’s commitment and we will carefully assist and evaluate each application received on an equal basis. Our admissions consultants are also available to guide you through each step of the application process if needed because we understand the importance of choosing the right education as a foundation for a bright future. 1. Please create your IFA Paris Online Application Account. 2. You will fill in all the information and choose the program you are applying for, as well as pay €150 application fee. Only after you have paid the €150 application fee, you will be able to upload the documents. 3. You will fill out and upload this Scholarship Application Form as well as the other required documents mentioned above.